In 2014, a year before Madison Presbyterian Church’s 200th anniversary, Jill Wiest and I volunteered to see what information we could find to enhance the celebration. 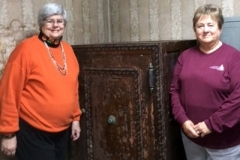 After looking through many old files, we wondered if we had found everything—after all, there are many nooks and crannies in our 1846 church building. 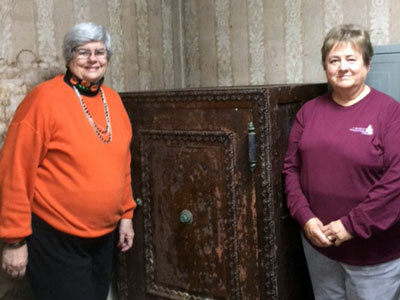 What about that old safe in the small room off the kitchen that had been the pastor’s study in the 1800s? It took a while to find the right key, but eventually we did and we opened it. To our satisfaction, it held a treasure trove of documents, letters, and ledgers that told of some of the highs and lows of Madison Presbyterian Church through the years. The leather-bound ledgers contained records of births, deaths, Sunday collections, and disbursements for supplies, among other official registries, but most interesting were the loose papers, many of which were letters. 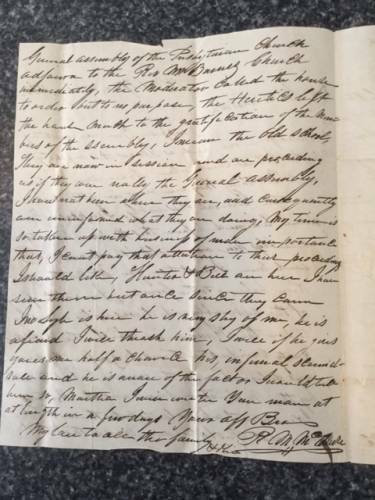 A large number of them were personal letters written to Clerk of Session and Madison businessman David McClure (1775-1836) and his family. 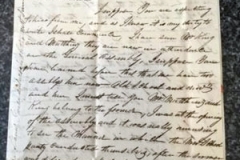 It is not known why these letters ended up in the church safe, but they have given us added insight into our early church history and 19th-century life here. 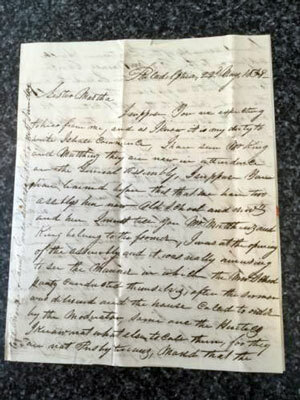 One letter was written in 1824 to McClure’s daughter Martha by a schoolmate, Eliza Ann Ristine, of Crawfordsville. 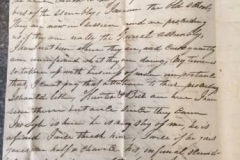 Her family had recently moved from Madison to that newly established settlement, and she wrote to her friend that there were only seven families living there. And “at this time, no school is here of any description and not much prospect of one for some time.” We felt this letter should be in Crawfordsville, so we donated it to the Montgomery County Historical Society. The next eleven have to do with the church itself: Name (Presbyterian Church of Livonia in Washington County); Original Number of Members (13); Names of Previous Pastors; Date of Founding (1816); Year When the Building was Erected (1820); and Description (log house, 20 by 40 feet, then a brick building, 30 by 55 feet, built in 1826). Question 9 asks if the church was divided in the “recent division of the church” and if so, “How many went to each branch of the church?” Answer: “About 100 went with the Old School, three elders and 25 private members adhered to the Constitutional General Assembly.” The final question: “Of how many members is your church now composed?” Answer: “50.” One of the members was the famous churchman of the Civil War era Henry Ward Beecher, brother of Harriet Beecher Stowe, author of Uncle Tom’s Cabin. We used much of the information found in the safe for our church’s 200th anniversary celebration in 2015. We hope to archive these papers at Hanover College, Hanover, Indiana. What a great time we have had in discovering our church’s hidden past! Lord Jesus, thank you for calling us and giving us the strength to respond, not only with words, which fade, but with our lives. We are grateful that you allow us to be your hands and witness in our communities and throughout the world. Help us to hear your voice for the changes you want us to make. Amen.